Tracking big players is at the very foundation of these indicators, If we can consistently reveal where the Big players are entering and the direction they are trading, then we have all the information we need to make a profitable trading decision and the Volume Activity and Weis Wave Volume indicators will help you do that. The largest market participants named "big players" or "smart money", those who move substantial volume in the market. This includes the largest banks, firms, global companies, insurance companies, Hedge Funds, as well as speculative traders around the world. The volume is so large that their position cannot be opened and closed in a single order without spiking the market. It is important to understand that although the banks might control the majority of the daily volume, the large part of that volume is those banks acting as a market maker for the other types of traders. If banks are primarily market makers then they will by default drive the market to and from areas of supply and demand which is the foundation in how we track them. It would be very interesting to identify where large market participants are likely to enter or exit their position based on likely areas of supply and demand, or manipulation points (trapping moves) as we term them because the top 10 banks control well over 60% of the daily forex market volume. The Volume Activity indicator will help you detect the most important volume changing in the market. Out of average volumes are a good signal that smart money or an institutional player got into the market. This tool will allow you to identify and define those entries and thus to determinate the best strategy based on market cycles. The Weis Wave Volume is an auxiliary tool that indicates how much order flux we have in the determinate wave. This tool separates and accumulates a volume of the up or down wave moves. The Weis Wave shows you the “movement fuel” or its intensity. If you have an increased cumulated volume in two successive waves, that implies an adding fuel in the direction of the current movement. It gives a strong sign of continuity of motion. See the image below. The increasing cumulated buy (green) volume waves demonstrate that the players are willing to fuel the market uptrend which leads to a probable future price rise. If you use the Weis Wave Volume associated with Volume Activity you can track the absorptions and aggressions of big players (banks, investment funds,…) in the market. Those indicators are complementary and using both at the same time are the best way to make out the big players positions and future movements. As you can see on the image below, there is absorption that occurred on top. 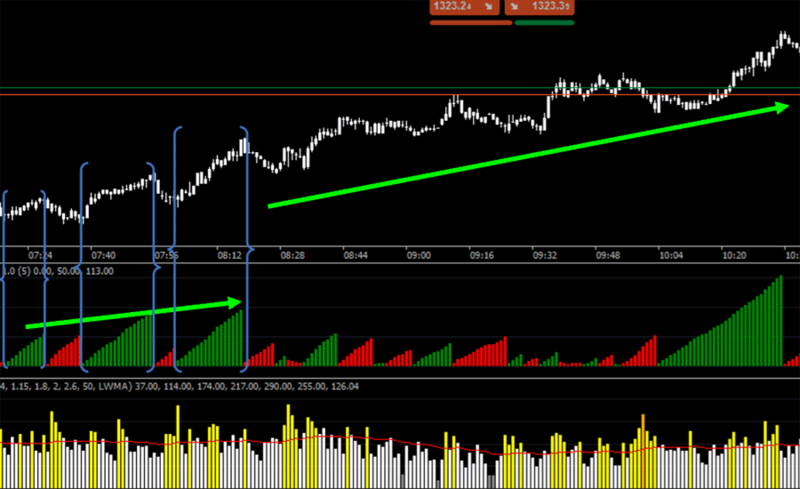 In the final moment of this large scale up the wave, you have a “red bar” on the Volume Activity (big player acting). This is a blatant sign of a big player’s absorption. Some big player is entering in the seller side while the market promotes the liquidity on the buyer side. Look that after the absorption the market trend in reversed and finally goes down. 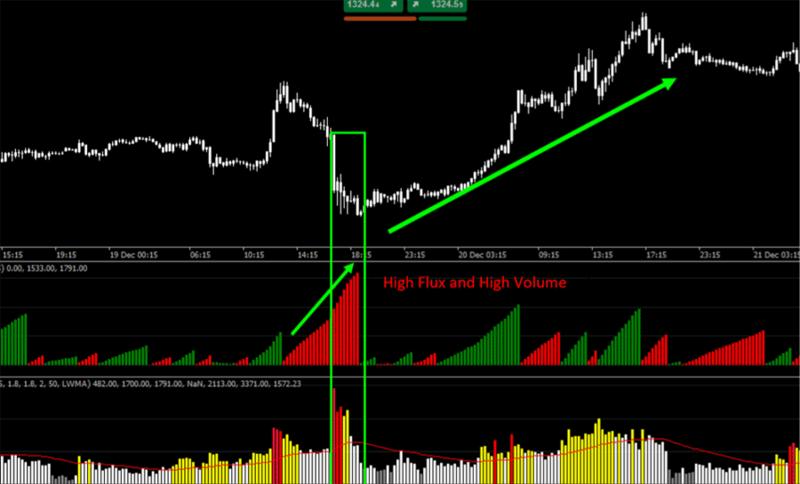 The absorption needs a high cumulated volume (flux) and high liquidity to actually give rise to a reversal in trend. The Volume Activity shows you how much bigger is the present volume activity than the volume average (MA). The parameters are simple and you can determinate a multiplier factor to analyze the volume. You can set the colour displays and the MA-related factors of low volume, average volume, high volume, very high volume and ultra-high volume. On the image above you can see an obvious bottom absorption. In conclusion, those two indicators working together will expose clearly a big player position and help you track his moves: aggression, absorption, accumulation or distribution. Low Volume: Indicates the low activity in the volume. Not relevant to trade. Average volume: Indicate that exists an average activity in volume. Many traders are getting in the market. The liquidity is growing up. The High Volume: Is the signal that the liquidity is very high and there is a lot of possibilities that the big players are getting inside the market. Ultra-High Volume: The volume growing up very fast and this situation is clearly the big player's actuation and manipulation. Period: Is the parameter to define the period to calculate the volume moving average (MA). Mode: SMA or LWMA: Is the MA (Moving Average) calculate method. Linear or Simple. These parameters are multiplier factor that defines how much bigger the volume is than moving average (MA). Depth is the criteria to define the calculate to zigzag waves and the waves up and waves down. The sets are adjusted between 5 – 12. It’s my favourite settings. If you have paid for this product and feel there is a problem with the indicators, please submit a support ticket.